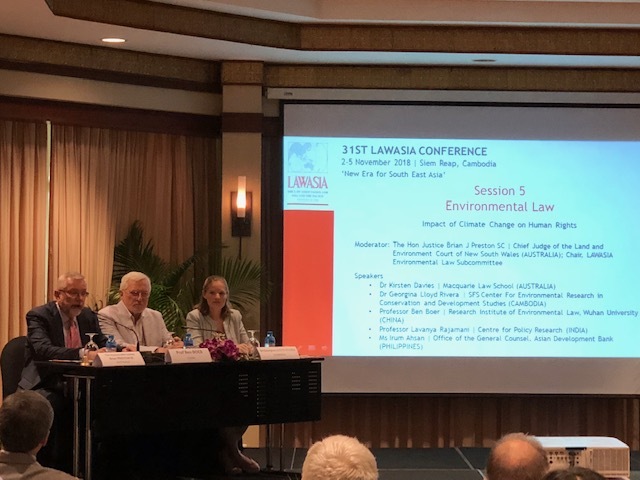 At the recent Lawasia Annual Conference in Cambodia, Watts McCray Director Justin Dowd had the pleasure of attending the challenging and stimulating Environmental Law session entitled “Climate Change and Human Rights”. The session was chaired by the Honourable Justice Brian Preston, Chief Judge of the Land and Environment Court of NSW. The speakers in the session emphasised the interdependence of climate change as a human rights issue, identifying as inalienable human rights, the right to clean water and clean air; the right to live in an environment that is healthy and as free, as far as possible, of climate extremes caused by human intervention. One of the speakers was Dr Kirsten Davies of Macquarie Law School (Sydney). Dr Davies made reference in her presentation to the Declaration of Human Rights & Climate Change. This Declaration was the product of the work of 14 esteemed academics. The Declaration exists on the web at https://gnhre.org/declaration-human-rights-climate-change.